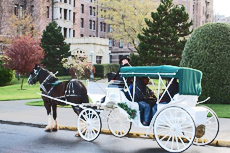 A horse-drawn carriage is the perfect way to escape into beautiful downtown Victoria. Too short and dark. Skirted City. Too much chatter about horses. Our driver was sweet and amazing, the horses were awesome, the views were phenomenal, the food at Fisherman&apos;s Wharf was amazing and the people were very friendly. Great little city tour, except for giggly tour guide and push to tip the excursion was great. Another excellent tour. A complete view of the city and sites. A litle brisk but well worth the time. You are there such a short time and we decided last minute to do an excursion. You are there such a short time and we decided last minute to do an excursion. This was the only one not sold out. It was enjoyable. Got a carriage in the city center was just about as cheap as the cruise ship an it was just me and my wife. Nice quiet enjoyable way to see the city. Nice quiet enjoyable way to see the city. It doesn&apos;t last long so you have time to go back into town and enjoy the sites! Tour horse-trolly was late getting to us by about 1 hour. Tour horse-trolly was late getting to us by about 1 hour. My grandson had a good time but I didn&apos;t find it particularly interesting and would not do it again. The carriage driver was very nice however. Excellent overview of Victoria. Driver told interesting stories giving subtext to the tour. Trolley was covered and there were large blankets for people who were cold. Tally Ho tour was a little light on the history of this beautiful town, but heavy on scenery & architecture. Tour guide was pleasant & personable. We went on the Victoria By Horse Drawn Trolley (VI04). Lovely quick tour in a city we only got evening hours in. Lovely quick tour in a city we only got evening hours in. Great driver and professionally run operation. People took pictures of us....and we got some great pictures. The city was absolutely beautiful, but the ship arrived so late we barely got time to see the city. The city was absolutely beautiful, but the ship arrived so late we barely got time to see the city. The cruiseline should arrange it where they arrive much earlier. Great tour driver - neat little ride for family and kids.Not sure why only in Victoria for a few hours, and night, at that. Don&apos;t get it. This was more fun than I was expecting it to be! Not enough time in this port. Not enough time in this port. 7:30 PM is late to get in and we sailed just after midnight. Didn&apos;t get to see much of anything here.